Google Translate has made the text-to-speech feature more useful by adding 27 new languages: Afrikaans, Albanian, Catalan, Chinese (Mandarin), Croatian, Czech, Danish, Dutch, Finnish, Greek, Hungarian, Icelandic, Indonesian, Latvian, Macedonian, Norwegian, Polish, Portuguese, Romanian, Russian, Serbian, Slovak, Swahili, Swedish, Turkish, Vietnamese and Welsh. Google used the open-source speech synthesizer eSpeak, but I'm sure that this is just a placeholder until Google manages to obtain better results. "You may notice that the audio quality of these languages isn’t at the same level as the previously released languages. Clear and accurate speech technology is difficult to perfect, but we will continue to improve the performance and number of languages that are supported," says Google's Fergus Henderson. Initially, the feature was only available for English, but 4 other languages have been added in the past two months: Haitian Creole, French, Italian and German. To try Google's TTS service, go to Google Translate, type some text, translate it and click on the audio icon to listen to the translation. Till now i was using its text to text translation. I never new it can speak. Its amazing... I heard "I love you" in many languages first time. I know these in tamil and telugu but these languages are not included into list, I will wait and varify translation after they will be available. actually, i know the eSpeak because i used it too for my final exam. 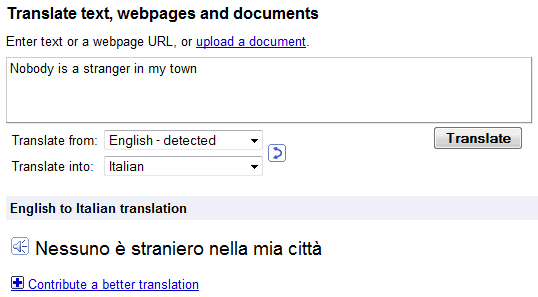 but still confuse with "how to create natural language like google translate now?" anyone can help?